I feel like I say that every place is my favorite place to play, but I really mean it about Hilton San Diego Spa and Resort. I grew up less than a mile away from Hilton San Diego Spa and Resort. As a kid, I used to roller blade on the boardwalk in front of it. My brother in law got married there and I have done many weddings for the event sales staff. Mary Bowerman, who works there frequently as a wedding planner, often recommends me for her weddings. Ok, I am being dramatic because these slide shows were super cute and were executed perfectly. What was hellish was the set up to execute them. For the record, the B&G were both super cool about everything the entire time, Shannen just wanted to make sure the slide shows played. She made a slide show for both parent dances. She also wanted a slide show looping during dinner. Shannen paid to rent a projector and screen through me to show the slide show when we first contracted the wedding. But the whole wedding was originally in one of the in door event spaces. They later changed the event space to the outdoor venue by the pool. There was my first mistake, I didn’t make the proper arrangements for an outdoor slide show. Fast forward a year to when Mary sent out the timeline. When I looked it over, I realized the slide show was set loop at 5:30pm when dinner would start. With the sunset at 7:30, no projector could project in that kind of light. That’s when I called the planner and we decided to get some quotes for TVs. These quotes came back at astronomically high numbers, because it’s for a wedding. I shared them with the bride and she agreed that it was too expensive but she still wanted the slide shows. I offered to change the time of the slide shows to after the sunset, but she really wanted them at the times specified. So I told her we could run with the projector and screen. That was my second mistake. When I arrived to set up, the wind from the bay was howling through the event space. I quickly realized that I would damage my screen beyond repair if I set it up. My last resort was to go to the in house audio and visual company PSAV. Without even thinking about it, I threw my credit card down to get a TV to run the slide show. They obliged and gave me a friendly discount. Once all the stress about the slide show was resolved, I kicked it into high gear and became the fun Wedding DJ I was hired to be. Once the wedding started, everything went flawless! When open dancing started, the dance floor was packed the entire time. Both the B&G were super happy and the father of the bride gave me a heartfelt compliment at the end of the night. Even though there were some areas I needed improvement on, I manged to learn my lesson without any damage to my client’s big day. What’s even better, I can apply that lesson to future clients and make sure that daytime slide shows are prepared and planned way in advance. I had known Joel and Michelle for more than 20 years each, individually. Joel went to University City High School and Michelle went to La Jolla, I met them both on Felpsar Street in Pacific Beach way back in 1996 or 1997. That was way before I was DJ Mikey Beats. Back then, we had a large crew of surf groms of about 30 who hung out all day and surfed. Although the crew was mostly dudes, we had a few girls who would hang out with us that surfed and Michelle was one of them. As time went on, the crew shrank in size as grown up responsibilities came into play. Fast forward roughly 20 years to a local bar called The Duck Dive where my friend Chris was having his birthday party. About 15 of our original crew showed up including Joel and Michelle. None of us know how it happened, but we all noticed when it happened. It was a spark that lit the room. Everyone of us took a deep breath and let out a collective “AW” as we exhaled. None of us understood how they never clicked before but we all knew how. They both had these silly little quirks about them that we all adored but it was each others gaps that the other filled. He told Dad jokes and she laughed at every joke. He had the greatest fish stories and she loved to eat fish. She was beautiful as could be and he had a beard. It worked. We all knew the day would come where he would pop the question, and he did. I don’t remember if it was a social media post or a group text but that day the future became brighter for us all. Their wedding was to be a small one in her families backyard and I told Joel he could not have a wedding without Mikey Beats. He told me they couldn’t afford a Wedding DJ and I told him that would be my gift to them. 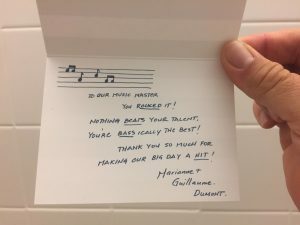 I can’t say that my decision to be their wedding DJ was only a gift to them. It was also a gift to me because I got to be there to watch my two friends become one. Marianne and Guillaume were referred to me by my buddy Robyn at R Nicole Events. 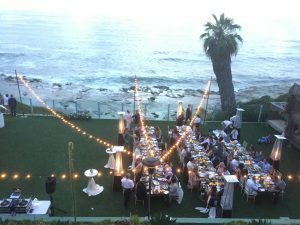 R Nicole Events manages the Garty Pavilion, where I was a wedding DJ at on back to back weekends. I love this place because it is on the water and with 15 minutes of my house. Marianne was from Canada and Guillaume was from France. Both had tons of family traveling from out of the country. The French were extra happy because their country was playing very well in the World Cup and looking to make it to the finals. The Canadians were extra happy because the weather was warm. One of the keepsakes was a small Canadian flag pin that I made sure I got one of. Since both were from two different countries and they met in America, the music was eclectic. The seating music was some down tempo kicking off with some Thievery Corporation. The Bride received some style points with her first processional song. At the Garty, the procession usually comes from a set of bay doors that roll up and down. The Bride was behind one of the bay doors with her father and she wanted me to play ACDC’s “Shook Me All Night” as the R Nicole Events staff rolled up the bay door. Once the doors was up, I switched the music over to a cover of “The Cello Song” by the Piano Guys. The cocktail music was mainly Indie Dance that transitioned into Deep House. The Dinner moved from 60’s Soul to 70’s Soft Rock and then into Indie Folk. Open Dancing was high energy with a small group of Spaniards constantly fist pumping and dancing erratically. The last song of the evening was a song I was not familiar with but quickly grew to love. It was “Les Champs-Elysees” by Joe Dassin. The French all gathered on the dance floor and sung as loud as they could. It was such a beautiful moment. I later recognized the song playing in Paris France as the city and country cheered on their team bringing the World Cup to France. Tips are nice but it is also nice to receive a handwritten letter form the B&G. It amusing me that they always write it before the wedding but word the letter like they wrote it right after. I thought this one was super sweet so I took a picture of it. Here it is. The Garty Pavilion in Mission Beach is hidden in plain sight. It is the next peninsula south of Santa Clara’s peninsula. If you don’t know where that is, you aren’t from San Diego and need to Google it. Chris and Sharlee weren’t from San Diego but they managed to find this little jewel of a venue. The Garty Pavilion is a perfect venue to for people who travel from across the country who want to get their toes in the sand. The two different parts of this venue is what makes it special. On the one side, you have the marina with boats dock and it faces west. On the other side you have the open bay that looks north. These locations produce two different areas of awesomeness. The music was a great mix to satisfy all in attendance and I was the Wedding DJ. Seating music was mostly acoustic with Jack Johnson and Bob Marley. For cocktails, they had my buddy Kekoa from Cityside, a local reggae band, play solo acoustic. That boy can rip it up! Dinner was a great mix of country love ballads, some classic Motown and some soft rock. Once open dancing started, everyone rushed to the dance floor to get their groove on. Julie reached out to me through my agency SGM Events Her and her fiance Jeremy were looking for an intimate wedding at a friends house in La Jolla right above the beach. After researching me, they decided that I was the perfect Wedding DJ for their special day. When I pulled up to the house, it was a little North of Big Rock which is famous surf spot in La Jolla, San Diego. What I didn’t prepare my self for was the two massive and steep flights of stairs to get down to where the wedding would be. I had to hand carry everything down the stairs and of course go back up when I was done. The house was an incredible 4 stories from the street down to the beachfront yard below. On the floor overlooking the wedding area was a huge indoor pool and Jacuzzi with a giant inflatable swan in the middle of it. In my head I imagined the owner being some sort of international business business man or woman. I was right. The house belonged to Fernando Aguerre the founder of Reef Sandals. This house is legendary in the San Diego surfing industry as a party house. I heard stories of wild parties with DJs, free booze with the who’s who of the surfing industry. I always wanted to do a party there and my time was there. Jeremy and Julie were a couple of chilled out Californians. Jeremy looked like he was birthed on a surf board with his bleach blond hair and his golden tan. Julie was glowingly gorgeous with long white dress that accentuated her baby bump. All they wanted was light beach music that complimented the scenery. For open dancing, they said keep it familiar and fun. Another SGM Events wedding in the book! This was my first opportunity to play at the Port Pavilion on the Broadway Pier. 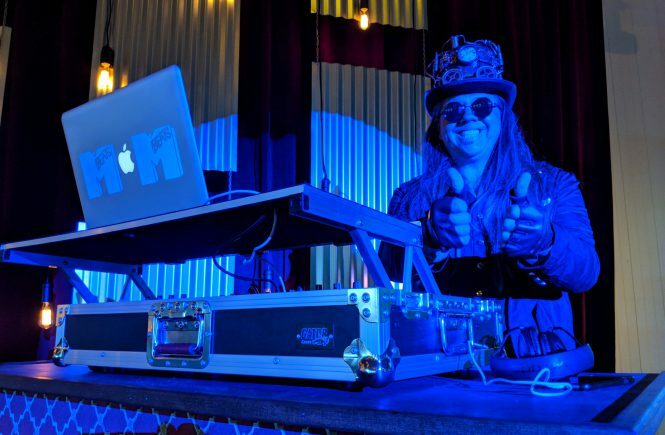 Mike Spangler of Spangler Event Productions reached out to me and said he needed a special kind of Corporate Event DJ to pull off his vision. I had told him I can do anything and he was ready to test me. Who or what is a Steampunk? I asked Mike for more details and he had to call me to explain. The call lasted about 20 minutes with him detailing the exact vibe he was looking for. He also said that I would have to dress in costume. I told him I was all about it. He didn’t know the type of music needed, he just told me that the event would be Steampunk themed. I like events that are out of the ordinary, especially when the music isn’t your typical event music. Ahead of me was some real research. My wedding motto is that I represent my clients musically but when it comes to corporate events, it’s different. 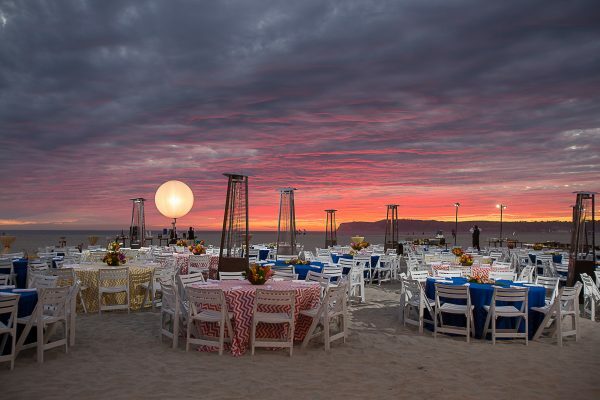 Every corporate event is different and it all depends on all the details and theme. In this case, it was Steam Punk themed so first I needed to learn what a Steampunk is. 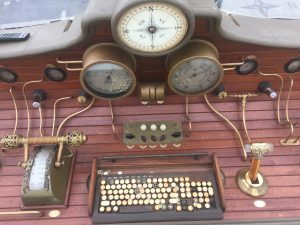 After a quick Wiki search I found that Steampunk “is a sub genre of science fiction or science fantasy that incorporates technology and aesthetic designs inspired by 19th-century industrial steam-powered machinery.” You’ll find that Steampunk fashion and decor has various sprockets, cranks and gears incorporated into it. Here is an example of a decorative piece at the event. My client had no idea what Steampunk music was but knew he wanted it to match. I quickly learned while I was researching that Steampunk doesn’t have a set genre. Rather it is a mix of genres from classical to ragtime. For this event, I decided to focus on a sub genre called electro swing. The event was to feature various performers from acrobats to contortionists so I envisioned music close to what you would hear at a carnival on acid. Once at the venue, I sound checked and jumped into my costume. I must say, this was one of the most fun corporate events I have ever played. Ethereal Open Air Resort in Escondido California is right off the 15 freeway and down a dirt road. The road opens up to this beautifully laid out estate with many structures surrounded with well kept greenery. It’s hard for me to describe the decor because a lot of it seems random but it all makes sense. It’s like a hipster, Masonite carpenter bought a summer christian retreat camp, then married a woman who owns an antique rental company and the both renovated the property. One thing that grabbed my attention was the crystal clear door knobs on all the doors inside the main house called the Marquis. Overtime I touched one of those I thought about David Bowie in Labyrinth. Mark and Melissa found me because Melissa works with my wife as a nurse at UCSD La Jolla. She had seen me play at their company holiday party which I have done for many years now. Side note, when nurses party they RAGE. Anyways, Mel hit me up to be her wedding DJ and I was honored. 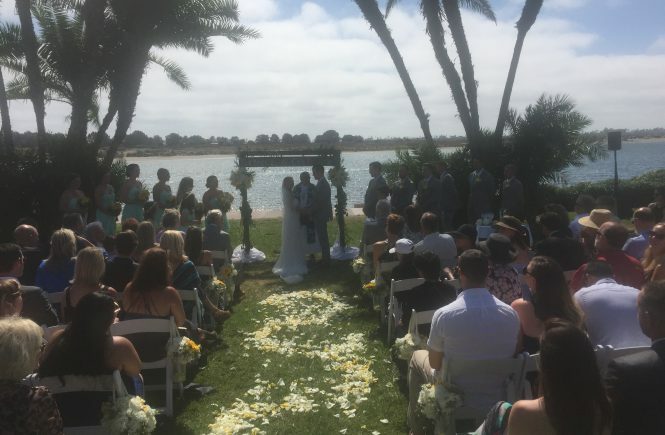 The ceremony was under a metallic gazebo on a swath of lawn about as big as a football field. Cocktails were had underneath this massive outdoor patio with no sides that also seemed as big as a football field. The dinner was held on the lawn outside of the Marquis room and the dancing was inside the marquis. This was a Thursday wedding which of course is out of the norm but this crowd partied like it was a Saturday night. The beats were banging and the drinks were flowing. 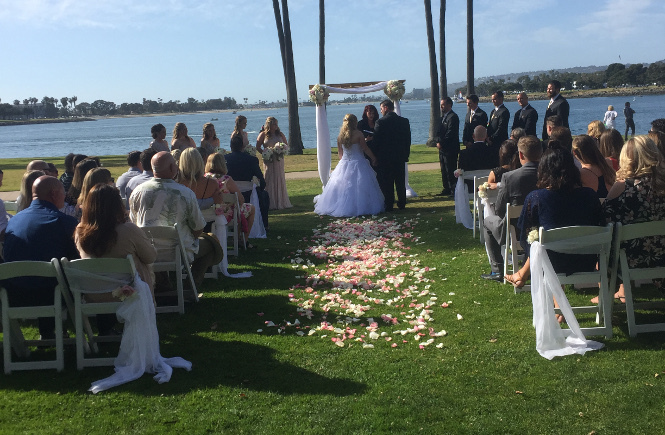 The Dana on Mission Bay is a gorgeous resort that is a wonderful place to get married. 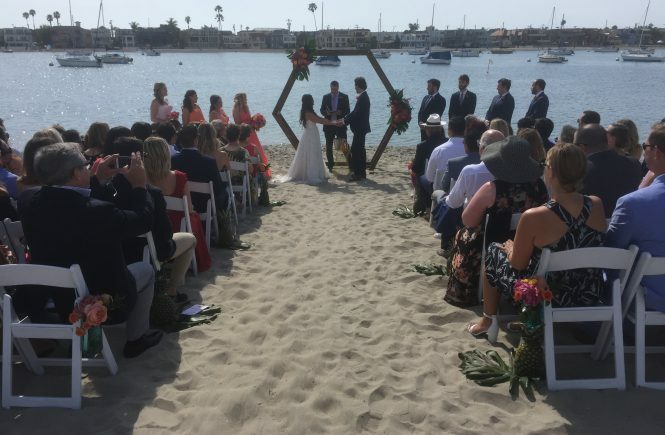 One ceremony location is on the north side of the property that faces the bay. The guests walk down a path in between two hotel room buildings. Then it opens up into a 180 degree view of the bay with grass stretching hundreds of yards in both directions. This area is shared by the hotel with the City of San Diego as the surrounding area is a park called Sunset Point Park. 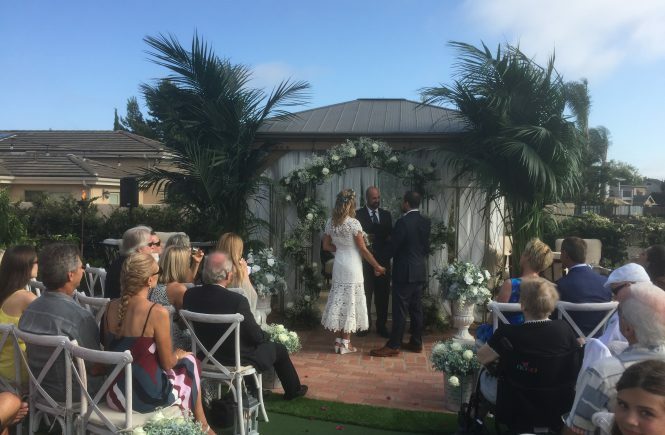 The other ceremony area is nestled in their beautiful and lush garden that is called The Dana Courtyard. This tropically decorated ceremony area is very private that creates an intimate setting for up to 150 people. Every time I am wedding DJ here, I feel like I am in Hawaii. 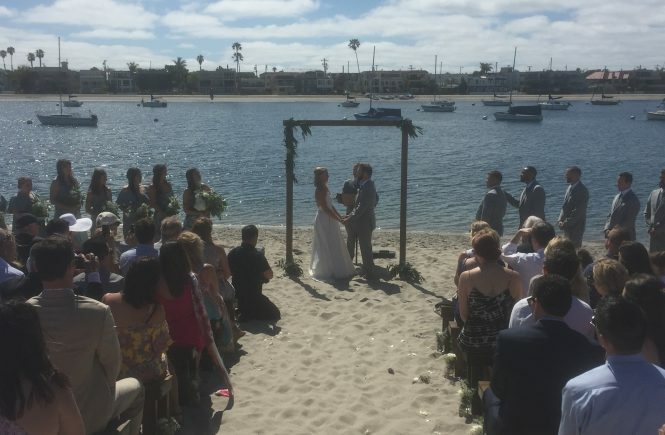 Both locals and out of owners get married there because it is centrally located in San Diego. It isn’t a very large hotel so there aren’t that many guests at any given time. 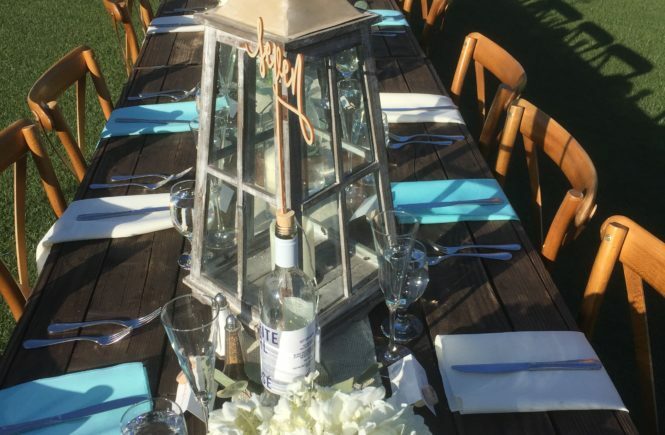 The event spaces are perfect for 100-200 person weddings. Brant and Laura were from out of town and were looking for that San Diego wedding experience. 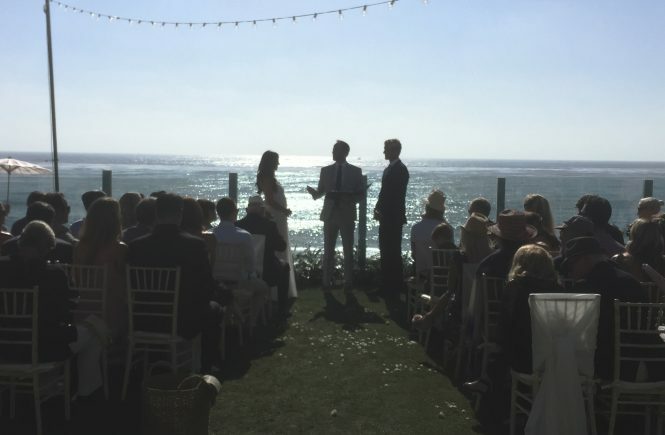 By playing acoustic music and reggae, I kept the vibe steady throughout the ceremony. The cocktail reception was high energy with country drinking music. The dinner was laid back with 70’s and 80’s soft rock. Once open dancing kicked off, the couple was looking for a lot of club music, so I obliged with some heavy hitters. 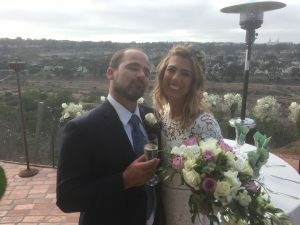 We wrapped a bow on the whole wedding by playing Ice Cube’s “It Was a Good Day.” Yes, it was a good day that lead into a great night at The Dana on Mission Bay. 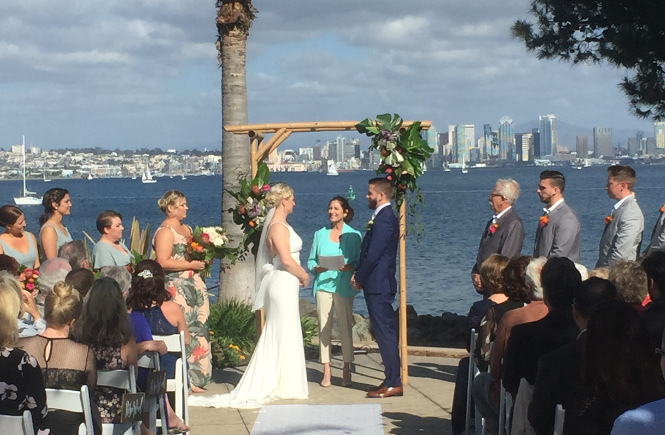 Bali Hai is one of San Diego’s best wedding venues for an island or Hawaiian style weddings. Whenever I get a chance to do a wedding where I am allowed to wear a Hawaiian shirt, I show up with my favorite Tommy Bahama. Otherwise I rock the linen suit with a Tommy Bahama tie. Speaking of Tommy, shout out to Tommy who runs the place with his Dad Larry. He said, “Yup” and walked away. I thought the conversation was over. He then brought the whole family to me and we all decided that it would be best if I was their wedding DJ. Let’s fast forward to the wedding day and Brooke’s Dad’s speech. The thing that got me was that before his speech, the man was balling his eyes out watching his daughter dance with her new husband. He then proceeded to give an excellent speech with funny memories, witty antidotes and great advice for a long lasting marriage. The father daughter dance was up next and he had specially edited it to start with Heartland’s “I loved Her First” and then transitioned into the chorus of LMFAO’s “Party Rock.” The two danced as I am sure they did for her whole childhood. FINALLY They stopped, hugged and he gave a thumbs up to his new Son in Law. Cheers. Mikey Beats was an absolutely amazing DJ! He knew how to get the crowd going, when to play the appropriate music, and followed all requests perfect! Mikey Beats was the highlight of the event! He was incredible from the beginning. Everything turned out great and our wedding was the best ever! We are really glad Mikey Beats took the time to meet with us before hand and everything he offered us was a total bonus.